Sterex brand gloves are recognized for their high quality and performance. They are made from highest-grade materials to provide a durable, highly elastic exam glove that protects from infection and transmission of bacteria and viruses. 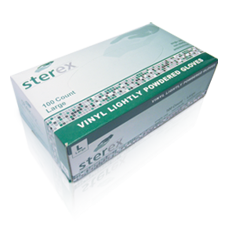 Sterex vinyl gloves are a safe, non-allergenic alternative to latex and are made from 100% natural rubber and every production lot is air-tested to detect pinholes. Powder free gloves are commonly chosen because of user allergies or in high contamination risk environments where the exposure to allergen powder particles is greater. Lightly powdered gloves contain cornstarch powder and are generally easier to don an easier to ware for extended periods. However, some users may be sensitive to powdered gloves. 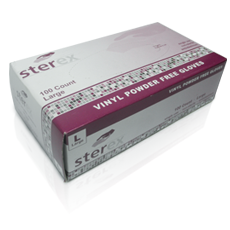 All Sterex Gloves are manufactured using the same processes and offer the same quality. Sterex general propose gloves are defined that way because they did not undergo the last stages of FDA testing. 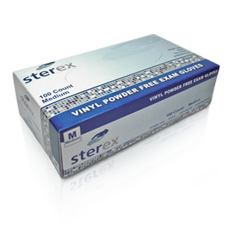 Sterex brand general-purpose gloves reach near-exam quality levels.